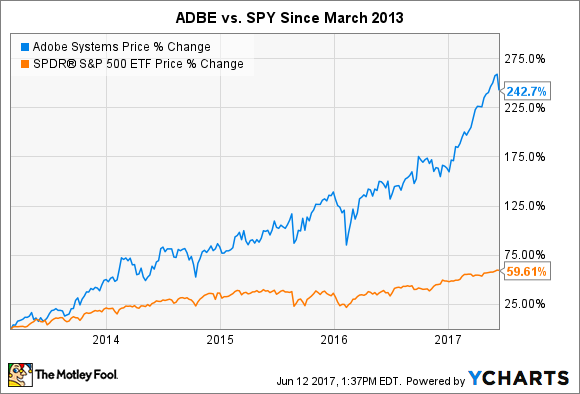 Here's why growth investors should consider giving SunPower, National Beverage, and Adobe Systems a closer look. Growth stocks tend to trade at a premium valuation since they promise to increase their revenue or profits at a faster clip than the average publically traded company. That high valuation tends to make some investors nervous since it usually increases the stock's volatility. Despite that fact, we Fools still think it is worthwhile for investors to buy high-quality growth stocks as long they mentally prepare themselves for a bumpy ride. So, which growth stocks do we have our eyes on right now? We asked that question to a team of our Foolish contributors, and they picked SunPower (NASDAQ:SPWR), National Beverage (NASDAQ:FIZZ), and Adobe Systems (NASDAQ:ADBE). Travis Hoium (SunPower): In 2007, the world installed 2.5 GW of solar capacity. This year, that number is expected to jump to 85.4 GW, according to GTM Research, and that's just the beginning of the industry's potential. Worldwide, less than 2% of electricity is generated by solar energy, and now that it's cost-effective versus fossil fuels in most of the world, we will likely see adoption continue to grow. Leading that charge is SunPower, a manufacturer of high-efficiency solar panels that are used in everything from handheld solar powered devices to massive solar farms. The company makes the industry's most efficient panel, which maximizes power generation at small solar installations like a residential rooftop or commercial building. But it's in the utility business where the company could see the most growth. A new technology SunPower acquired in 2015 from Cogenra is allowing it to shingle commodity solar cells into a panel that's more efficient than Chinese competitors while being similarly priced. And 400 MW in Mexico and up to 5 GW in China, from a joint venture, could drive the company's growth long term. The combination of a leading technology for locations that require high efficiency and a scalable product at the utility scale makes SunPower a great option for investors looking for growth in solar. And with its stock trading at a fifth of the price it was a few years ago, it could be just the combination of value and growth your portfolio is looking for. Demitri Kalogeropoulos (National Beverage): People can't seem to get enough sparkling soda, and National Beverage is profiting from that soaring consumer demand. The company behind the hit La Croix water franchise has seen revenue climb 15% over the last 12 months even as the soda giants struggle to post any gains at all. Its most recent results were even more robust, with sales up 20% thanks to an 18% spike in volume. National Beverage is also posting higher average prices, which has allowed gross profitability to jump to 39% of sales from 32.5% a year ago. On an operating basis, margin recently cracked 18% of sales -- up from 11% in 2015 -- to put the soda specialist within reach of industry giants Coca-Cola (NYSE:KO) and Dr. Pepper Snapple (NYSE:KDP). Unlike those companies, National Beverage's portfolio is heavily focused on what you might call nontraditional growth categories, including sparkling water, energy drinks, and juices. In contrast, the traditional cola drinks that account for about half of the industry's sales volume only make up 15% of its business. In other words, National Beverage has the right portfolio in place to benefit from the long-term move away from the colas that used to dominate the industry. This year, bottled water consumption is set to surpass carbonated soft drinks and become the biggest beverage category in the U.S. That makes it worth paying attention to this relatively small beverage specialist as it soaks up market share during this fundamental shift. Brian Feroldi (Adobe Systems): Many established software companies have transitioned their business model away from one-time licensing sales and instead have opted to sell access to their products through the cloud. Adobe Systems' CEO Shantanu Narayen started to push for this move back in 2013, which caused a bit of an uproar at the time. However, that move now looks like it was a brilliant decision in hindsight since Adobe's investors have enjoyed a huge run since that time. Why have investors cheered the business model change? Subscription revenue is recurring and is far more reliable than one-time sales. That's why Adobe now highlights a metric called annualized recurring revenue (ARR) in each of its quarterly reports. What's more, now that the cloud platform has been built out, it doesn't cost the company much to add new customers. A look at the company's recent results shows just how profitable this change has been for investors. Adobe's ARR increased by $265 million sequentially to $4.25 billion as more consumers switch to the company's cloud services. The gain helped drive a 22% increase in quarterly sales but a much smaller increase in expense. When combined with the company's healthy share repurchase program, Adobe's EPS exploded 60% higher. Looking ahead, market watchers believe Adobe's bottom line will grow in excess of 19% annually over the next five years as more consumers make the switch. That makes Adobe a great growth stock for investors to get to know today.